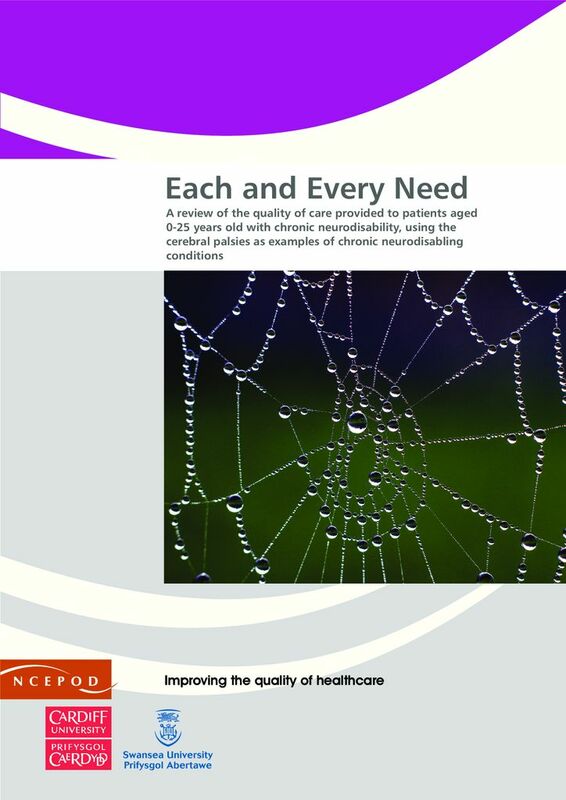 The overarching aim of this report by National Confidential Enquiry into Patient Outcome and Death (NCEPOD) is to improve the care provided to children and young people aged 0-25 years with a chronic neuro-disability. The cerebral palsies have been used in the study as examples of neurodisabling conditions. Each and Every Need follows a trail of child health reports which began in 2006/7 with the publication of ‘Why children die’ by the Confidential Enquiry into Maternal and Child Health’. Multiple data sources were used to collate an overall picture of the services available and the care provided. The analysis of routine national datasets has used their potential to provide population-based quantitative summary information about NHS utilisation for children and young people with the cerebral palsies in comparison with children and young people without cerebral palsies, showing trends by age, social economic status, inter-country comparisons and comorbidities over time. Analysis of data from clinical questionnaires, case review and organisational data have provided a detailed picture of current practice across healthcare services. To download the full report or summary report click on the links below.